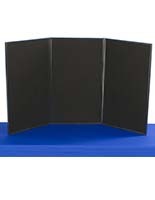 More Secondary Color & Color Options Available! 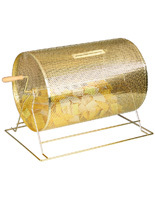 More Number of Prize Slot Options Available! 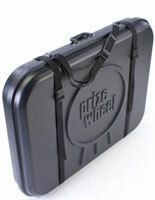 More Wheel Diameter Options Available! 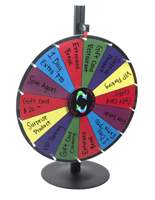 When it comes to an upcoming business function, there’s often a long checklist you go through to ensure you have everything you need. 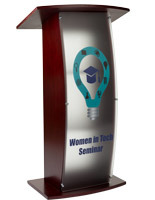 Our meeting and presentation tools are must-haves for these types of events. 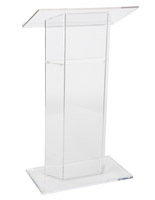 Whether you’re looking for speaking platforms, promotional items, or general supplies, we have hundreds of options to make your production a success. 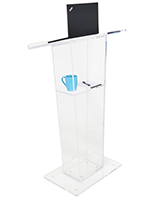 There are a wide variety of professional meeting and presentation tools to fit any setting, even temporary events like trade shows and expos. 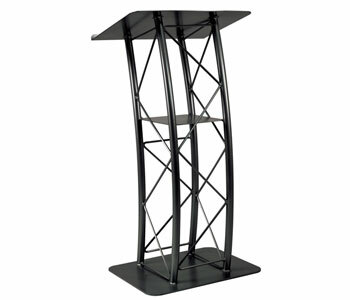 Browse through our selection of presenting necessities to find exactly what you need. 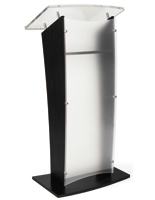 We’re confident our catalog of meeting and presentation tools has everything you need to make your event a success. 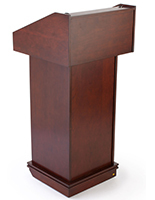 What types of products are available to enhance my speech, seminar, or business function? 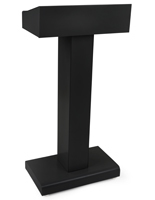 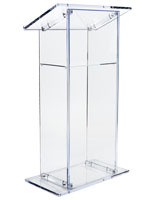 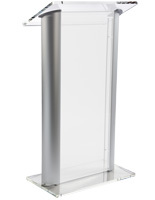 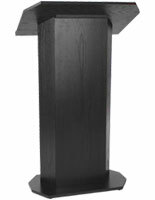 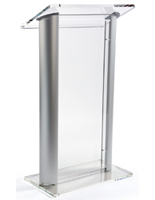 Podiums and lecterns are available in all sorts of styles and materials including ones with wheels, portable units, and height adjustable models. 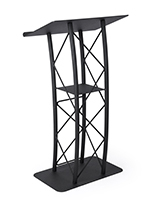 Units with shelves that can be removed or adjusted to house presenting materials can also be purchased along with ones that have the option of customization. 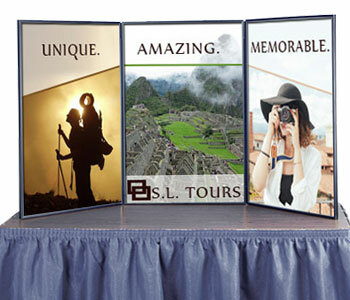 These come in handy for printing a company name, logo, or slogan of an event. 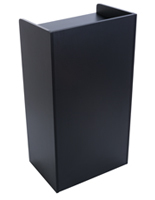 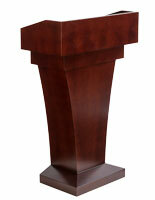 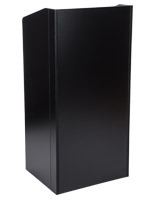 We even have podiums that come shipped fully assembled and countertop models. 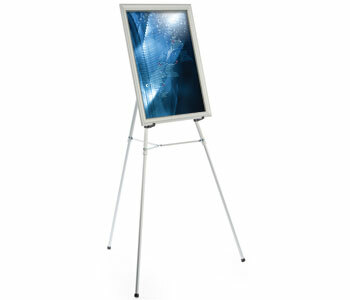 Easels are a great way to display large charts, photos, and posters that are essential to your meeting or presentation. 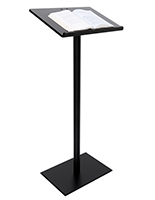 Choose from styles with frames and boards included, units that are height adjustable, portable, can tilt, and models that ship fully assembled. 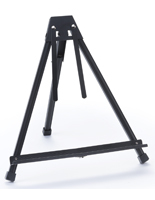 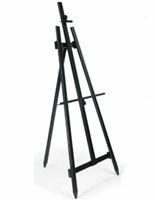 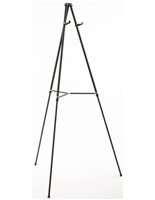 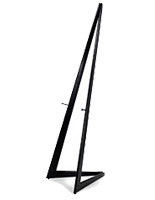 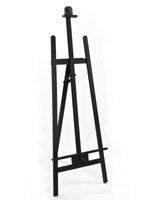 The options are endless when it comes to the proper easel to display your material. 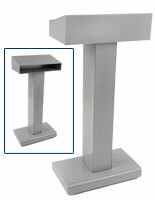 We have floor standing options as well as ones that fit on a countertop for a more intimate setting. 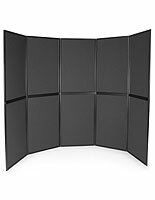 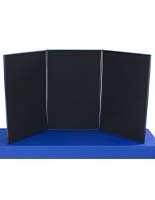 Boards for presenting are made from hook-and-loop receptive fabric and can be ordered in an assortment of colors - some are even magnetic receptive. 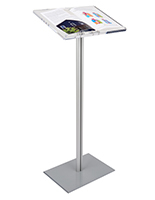 The great thing about fixtures with this feature is that you can really make the display your own and hang posters, flyers, and more. 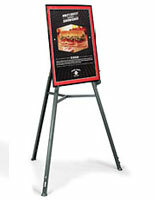 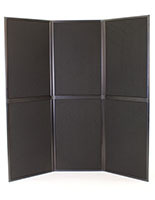 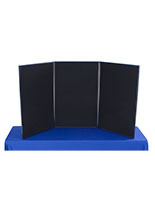 Available in countertop and floor standing models these portable boards are great for seminars, trade shows, and expos. 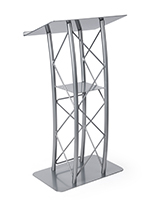 Multimedia carts and laptop stands are exactly what you need to house your computer, projector, and other equipment while you’re presenting. 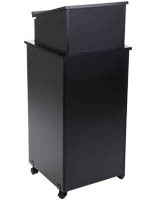 These carts have wheels for added portability for moving throughout a room. 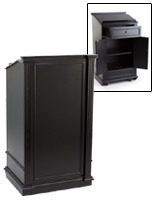 Some have the option of adjusting the height or shelves and others can lock and have enclosed storage areas to secure valuables. 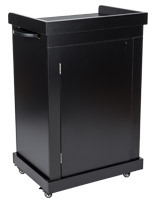 Most carts have power strips included for an added convenience factor. 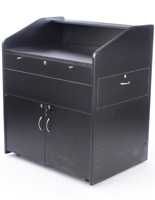 These workstations come in different colors, even some natural wood finishes to fit any environment. 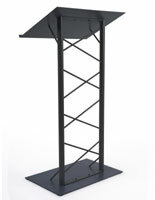 Laptop carts have more open layouts with shelving for storing materials and other accessories. 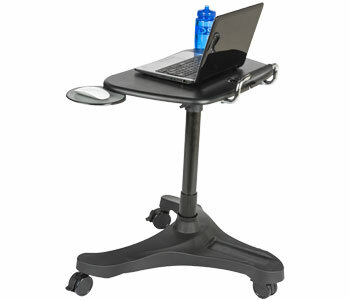 For the office, we have laptop and monitor lifts. 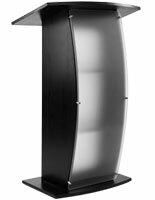 A/V equipment like projector screens, sound systems, and microphones are just what you need to get the attention of an audience. 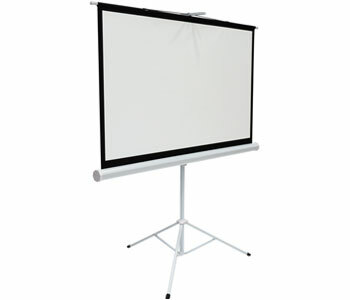 We have projectors that can be wall mounted or ones that are floor standing in a variety of different sizes. 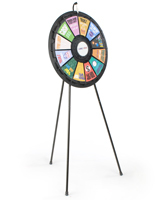 Raffles, prize wheels, promotional items, and gaming supplies are essential to engaging with potential customers and creating team building activities with coworkers. 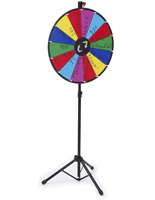 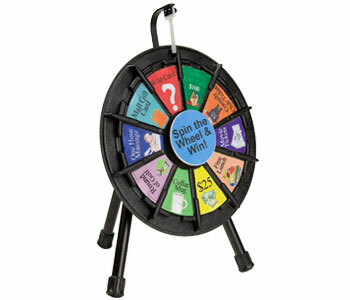 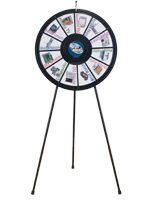 Trade show exhibits can use these wheel games to give away goods and services. 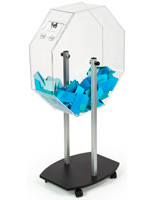 Companies can use them to engage with their employees and offer incentives. 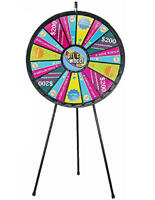 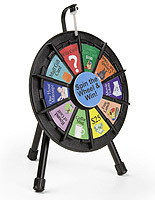 There are prize wheels available with write-on surfaces where customers can produce their own content and others with printable templates that have messages you can choose from. 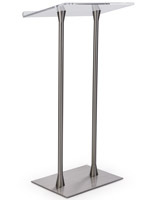 Floor standing and countertop models are available for the best of both worlds. 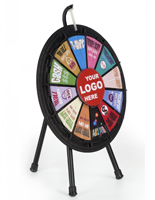 Pass out promotional items like pens, bags, and water bottles at company events or trade shows with logos or catchy slogans. 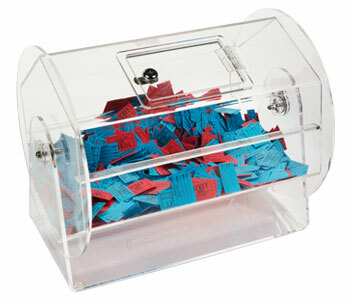 Raffle drums come in countertop and freestanding designs and they’re ideal for community and school events. 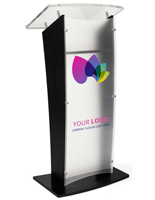 Displays2go has everything you need to make your next business function a success. 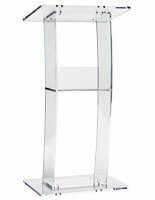 Shop online to take advantage of quick shipping and low prices on high-quality products.